Uniraid is a great human adventure and solidarity for students between 18 and 28 years with an entrepreneurial spirit. There are 9 stages through the Moroccan desert in 20 years old cars, which takes place annually in February. UNIRAID is neither a rally nor a speed race, Uniraid is a journey-adventure in which participants must complete 9 stages navigating with a roadbook, and bypassing all obstacles, challenges and tests, during the adventure, the students have to give a minimum of 30kg of scholar material. Pol Tarrés teamed up with Eloi Paré, one of his best friends. They came up with the idea of the giant sunglasses on the top of his Seat Marbella so everyone could see their car in the middle of the desert. "The adventure began on February 24th embarking on the GNV ferry that would take us from Barcelona to Tangier, there, it would start the adventure Uniraid 2017. During the adventure we had to work hard as a team to overcome the obstacles that we found on our way. The constancy and management of resources have been key factors in finishing all the stages, until reaching the final line in Marrakech. From the first moment we wanted to take as much material as we could charge in our 1996's Seat Marbella. In total we load 62 kg that we managed to distribute during each stage in the villages and schools most needed in the Western Sahara. From clothing to lipsticks, to school material. In each stage we realized that with all the effort and sacrifice we can overcome limits that we would never believe we could surpass, and we are proud to be able to say that we are "FINISHERS" of the best solidarity adventure for students of the moment. In addition, during the adventure we have been able to enjoy unique landscapes, rivers of sand, giant plains that never ended, impossible dunes and complicated dirt tracks where preserving the mechanics was crucial to be able to finish. The idea of D.Franklin glasses was a total success, the people did not believe what we had done. 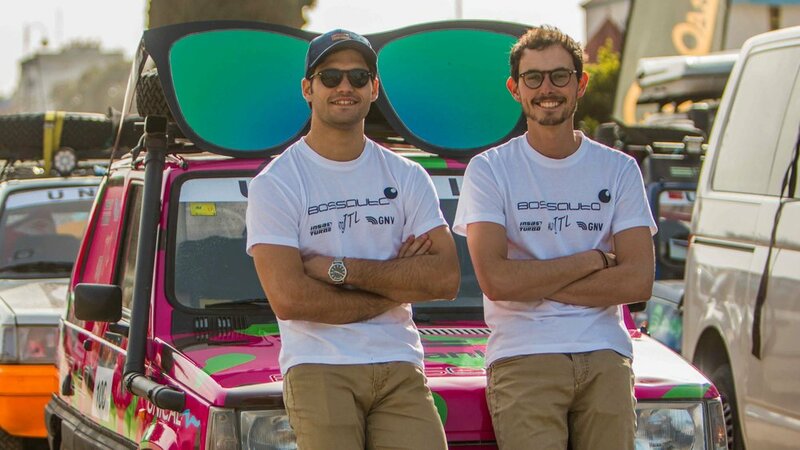 The fact of having the giant glasses on the car made our car the coolest in the rally. Moreover, thanks to the giant glasses we were in all the daily videos of the organization and they dedicate a full interview to our team. The winning image of the Uniraid 2017 adventure photography contest is one of our car surfing on a dune. "